The impulse to work beyond art’s immediately recognizable spheres and magnify its relational aspects marks a distinct and important approach within contemporary art. This symposium, taking place on Saturday April 12, will focus on key terms that have come to define social practice over the last two or more decades, in addition to more speculative terms, with a view to critically considering the assumptions upon which such works and their reception are made possible. In particular, the symposium responds to the urgent need to build on the very rich and prolific contemporary discussions about such practices by carefully examining how, to what end, and on whose terms engagement with communities outside of art takes place. With an awareness of the ease with which social engagement can read as ethical or critical simply by deploying ostensibly democratic or nonhierarchical practices, the symposium aims to question the default read of social practice as inherently good, while at the same time highlighting practices that have worked in extremely important ways. The symposium is structured around a running list of terms that either have been or might be aligned with social practice art. 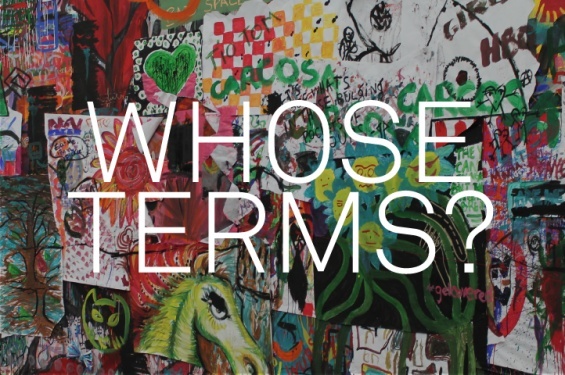 Of the roughly fifty terms, nine will be taken up at the symposium by invited speakers who include artists, art historians, theorists, and curators. Addressing individual artworks, theoretical arguments, historical precedents, or manifestations of the terms in interdisciplinary contexts, speakers will speculatively complicate and even challenge given terms of social engagement in art, while positing and testing new criteria. The remaining terms (those not being addressed by the symposium speakers) will be posted on Six Degrees on March 31, initiating an open call for other glossary “entries”; select responses will be published online in late April. Speakers and open-call contributors will be encouraged to approach these sometimes exploratory, other times pivotal, terms in highly particular ways, and to stake out singular positions. The word list is intended to be fully idiosyncratic and to allow for the distinct, even polarized, positions of individual participants. The final collection of words and entries will likely be uneven, contradictory, and have variegated tonality via its assemblage of disparate voices. Christoph Cox is Professor of Philosophy at Hampshire College and teaches at the Center for Curatorial Studies, Bard College. He is the author of Nietzsche: Naturalism and Interpretation (California, 1999), coeditor of Audio Culture: Readings in Modern Music (Bloomsbury, 2004), and coeditor of Realism Materialism Art (Sternberg, forthcoming). The recipient of a 2009/2012 Arts Writers Grant from Creative Capital/Warhol Foundation, Cox is Editor-at-Large of Cabinet magazine, and his writing has appeared in October, Artforum, the Journal of Visual Culture, the Wire, the Journal of the History of Philosophy, and elsewhere. He has curated exhibitions at The Kitchen, the Contemporary Arts Museum Houston, New Langton Arts, and other venues. Cox is currently completing a philosophical book about sound art, experimental music, and metaphysics. Alexander Dumbadze is the author of Bas Jan Ader: Death Is Elsewhere (University of Chicago Press, 2013) and coeditor and coauthor, with Suzanne Hudson, of Contemporary Ar: 1989 to the Present (Wiley-Blackwell, 2013). He is an Associate Professor of Art History at George Washington University, and is currently at work on a book about Jack Goldstein. Marc Herbst is an artist, writer, and coeditor of the Journal of Aesthetics & Protest (joaap). He is interested in the expansive field at the intersection of the environment, livability, and culture and his work is based on an appreciation of the multitudinous potential of being as informed by activist and cultural struggles. With joaap, Herbst has collaboratively edited ten books, including, most recently, a conceptual catalogue for New York City’s Museum of Reclaimed Urban Space (edited with Benjamin Shepard, designed by Emily Larned), and a translation of Ada Colau and Adrià Alemany’s Mortgaged Lives (translation by Michelle Teran). Herbst has authored a comic book series on possibilities for a postcapitalist, post–global warming style of dress, a zine on pre–World War Two German youth groups, and has an ongoing project encouraging people to watch plants instead of the news. He’s been employed and occupied by an array of disciplines, and he performs, presents, and teaches internationally. Herbst is currently a PhD student at Goldsmiths Centre for Cultural Studies. JEQU is a New York–based collaboration between curator Howie Chen (Dispatch, NY) and artist/attorney Jason Kakoyiannis to assess how sociological and cultural economic approaches can help art producers generate new critical demands and leverage within the space of cultural production. How can the robust analytical tools and models of the social sciences—whether they be data driven, behavioral, network, or quantitative—be utilized to mend the deteriorating ability of critical practice to narrate its own complex reality? JEQU’s work has been featured in DIS magazine and exhibitions at IMO, Copenhagen, Formalist Sidewalk Poetry Club, Miami, USC Roski School of Art and Design, Los Angeles, White Columns, New York, and Dispatch, New York. JEQU has also organized presentations with sociologists including Olav Velthuis and Luc Boltanski. Laurel Ptak is a curator, researcher, and Executive Director of Triangle Arts Association, New York. Together with artist Marysia Lewandowska, she is co-editor of the recent book Undoing Property? (Sternberg Press, 2013), which explores artistic practices in relationship to immaterial production, political economy, and the commons. Julia Robinson is Assistant Professor in the Department of Art History at New York University. In 2013, she co-curated the exhibition “±I96I: Founding the Expanded Arts” at the Museo Nacional Centro de Arte Reina Sofía, Madrid. She is the editor of the October Files volume John Cage (October/MIT Press, 2011), and curated the 2009–10 Cage retrospective “The Anarchy of Silence: John Cage & Experimental Art” at the Museu d’Art Contemporani in Barcelona (MACBA), which traveled to the Netherlands and Norway. Other curatorial work includes “New Realisms 1957-1962: Object Strategies Between Readymade and Spectacle” (Reina Sofía, 2010), and a retrospective on the Fluxus artist George Brecht at the Museum Ludwig, Cologne (2005), while completing her PhD on the same artist at Princeton University. Her writing has been published in Artforum, Grey Room, October, and Performance Research, among other journals. She is currently writing a book-length study of George Brecht (forthcoming 2015). Jonas Staal is a visual artist whose work deals with the relation between art, propaganda, and democracy. He is the founder of the artistic and political organization New World Summit, which develops alternative parliaments for stateless political organizations excluded from democracy, and the New World Academy (together with BAK, Utrecht), which invites artists and students to work together with stateless organizations. He is also the initiator of the Ideological Guide to the Venice Biennale, a free smartphone app that provides insight on the social, political, economic, and overall ideological backgrounds of every pavilion in the 2013 Biennale. His upcoming book Nosso Lar, Brasília (Capacete & Jap Sam Books, 2014) investigates the relationship between spiritism and modernism in Brazilian architecture. Staal is currently working on his PhD on art and propaganda in the twenty-first century at the University of Leiden, the Netherlands. Sally Szwed is the Program Manager of Global Initiatives at Creative Time, where she runs the annual Creative Time Summit and the Global Residency Program. Previously, she served as Program Manager of EFA Project Space at the Elizabeth Foundation for the Arts in New York City, where she produced exhibitions, workshops, and other events. Szwed has independently organized numerous public programs, including a series of parties welcoming new artists to the city, experimental wine tastings, and recent projects for Open Engagement and Flux Factory. She holds a BFA in Sculpture from Syracuse University and an MA in Curatorial Practice from California College of the Arts.